Igor Kalinauskas (Silin is his stage-name) graduated with honors from the drama school named after Schukin, Directing faculty, in Moscow. He used to work as a director in Minsk, Astrakhan, Izhevsk, Moscow, Kyiv having produced 68 plays altogether. Igor is the author of a unique psychotechnique initially elaborated for actors and later on widely applied in many areas. Yet 20 years on thousands of people learn the methodic and use it in everyday life. Igor also is a philosopher, psychologist and painter. Olga completed the course at Kyiv Institute of Dramatic Art named after Karpenko-Kary. Joined the theater in Kyiv and worked there for some time. Meeting with Igor Kalinauskas defined her further destiny. In the beginning she used to take part in the dramatic plays of Igor’s drama studio called the Fireflower. While her work there Olga mastered a unique psychotechnique. The later coupled with the natural gift and willing to work finally resulted in creation of Duo Zikr and the first performance at the stage of Smolny cathedral in St. Petersburg. 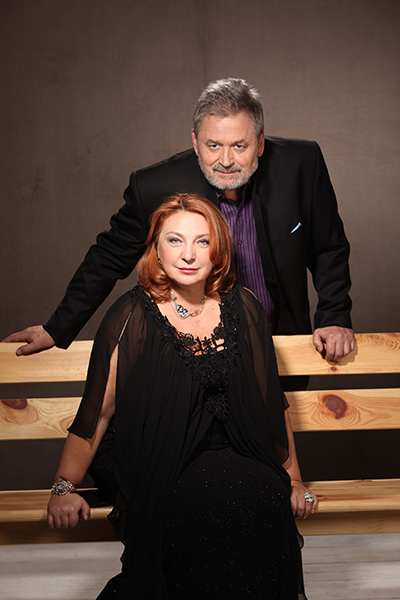 In 20 years of creative activity Duo Zikr has cut over 20 discs, held dozens of concerts almost in every part of the world, and cooperated with many famous musicians: among them Boris Grebenshikov, Sergei Kurekhin, Andrei Samsonov, and Givan Gasparian. Duo Zikr is the duet of vocal improvisations of Igor Silin and Olga Tkachenko – the only Magic Theatre of Voice in the world whose art compels the audience to experience the whole range of human emotions. “Zikr” is Arabian for “Prayer” – a spiritual practice aimed at revelation of an internal sense of divine presence. The Art of Igor and Olga unites profound philosophy and unique combinations of vocal techniques with chamber and folk vocals, Tibetan Mantra vocal techniques, Tuvan guttural singing, Sufi Zikr, Orthodox rites and more. The vocal range of the duet composes 8 octaves. The Duo has produced some striking videos which were recognized at various contests. For instance “The Road to Katmandu” shot under the direction of Fedor Bondarchuk got the prize at “Pokolenie-98” (“Generation-98”) music clips festival. Ms. Irina Taymanova, production director and musician, made a 20-minute long movie about duo Zikr called “The Wandering of Souls” that received the grand-prix of “The Velvet Season” international festival. The Duo has staged concerts in the USA, France, Italy, England, Finland, Slovakia, Israel, Australia and other places around the globe. It has been featured several times at the international sound recording and music market MIDEM in Cannes and Hong Kong. Ms. Tkachenko and Mr. Silin have long history of performing in Roman Catholic Churches and temples where, according to them, “You can perceive the music of the Duo the best”. The Duet’s art does not fit in any format and critics are unable to find an appropriate niche for them, but Duo Zikr goes on its Ascension – from the full house at their debut in Smolny Cathedral in 1993 – to the prayer hall of SHAOLIN monastery, where their music is being played today. Numerous international music shows and exhibitions: Berlin Independence day, Citta di Castello, Sergey Kuryokhin 3rd International Festival, A CAPELLA (St. Petersburg) , MIDEM Asia, MIDEM Barcelona, MIDEM Cannes (2009, 2010, 2012, 2013) etc. 20 years of creativeness and world popularity!